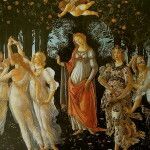 Several years ago, I stumbled on collage as a way to conquer writers block. It still works like magic. While I love being a journalist, sometimes I’m restricted by editorial guidelines and word counts, not to mention deadlines. 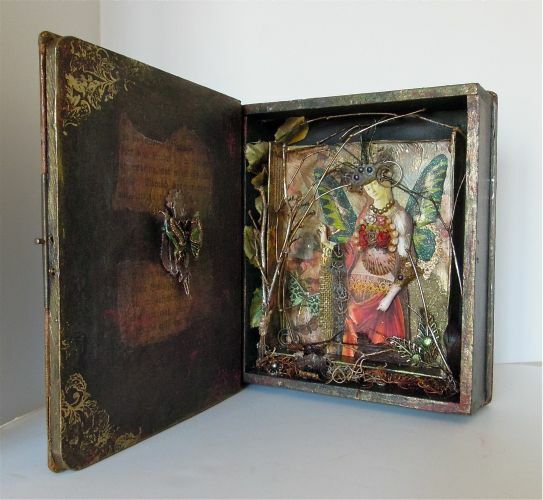 But my altered art projects are crafted freely from my own imagination, at my own pace. I like to think of them as another form of storytelling. 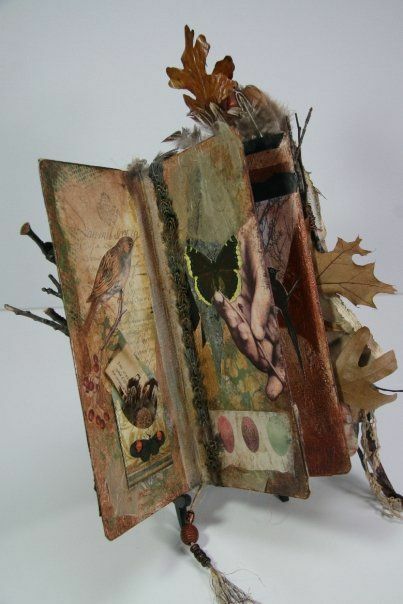 Inspired by art and craft magazines, I started experimenting with a variety of mixed-media techniques and entering juried competitions. It doesn’t matter if my work is selected or not; I take pleasure in making art from things that other people discard. 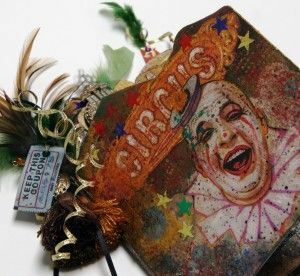 Given that I’m such a magpie, it’s not unusual for rusty hardware, religious medals, recycled greeting cards, vintage fabrics, feathers, and broken costume jewelry to find their way into my mixed-media pieces. This piece is my homage to childhood vacations with my maternal grandparents. My Granny Bee, a believer in magic, was the first to introduce me to the wonder of fireflies glowing on hot summer nights in southern Indiana. 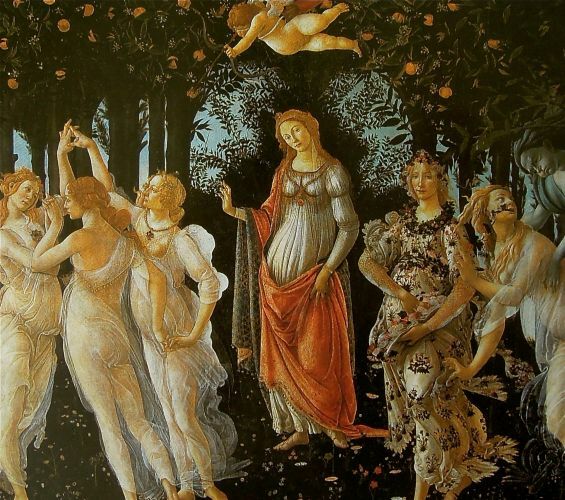 She knew how to spark a child’s imagination — and knew how to conjure happy memories from ordinary experiences. 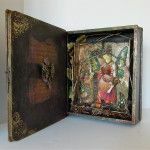 I made “Fairy Tale” from a promotional whiskey box. Drained of its original contents, the wooden box had found its way to a flea market in downtown Clawson, where I purchased it for five dollars. Stamped with the words, “The Glenlivet Scotch Story,” the front cover opened like an old-fashioned storybook and was ready to tell a different tale. 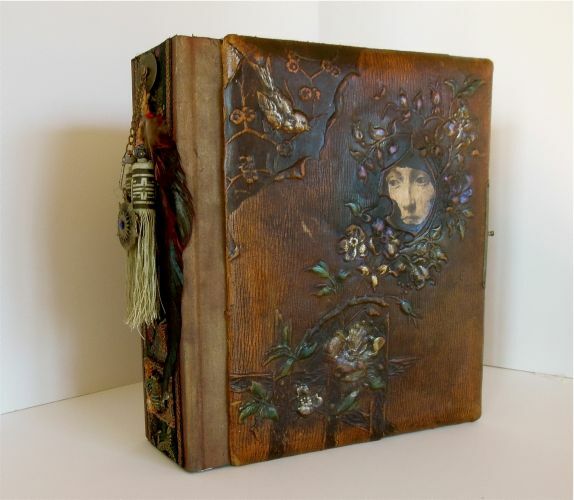 The leather covers (on the back and front of the piece) were rescued from Granny Bees Victorian family photo album — a brittle relic that was literally falling apart at the seams. Before attaching the covers to the box, I repaired the tooled leather and preserved it with a matte coating. 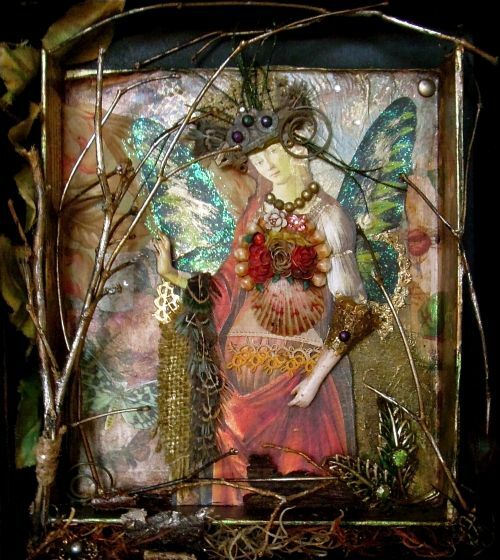 The woodland “fairy” inside the box was borrowed from Botticellis “Primavera” — a favorite image of mine — and is dressed in vintage found objects and fabrics. For a closer look, click on all the photos in this post. The Michigan Annual XLI runs from Jan. 24 through Feb. 21. Anton Art Center is located at 125 Macomb Place, Mount Clemens, Michigan. Please visit the Web site for hours and directions. To view a gallery of my artwork, please visit my new art site: Cindy La Ferle’s Mixed-Media. 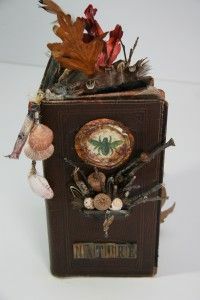 The other piece (at left) is an altered book titled “Nature.” A tribute to Thoreau’s Walden, it was made from a vintage insurance ledger and embellished with things I collected on long walks and bike rides. While I’m taking a break this week, I wanted to share a small piece of good news with you…. Earlier this month, I was honored to learn that one of my altered books, “Nature,” was chosen for inclusion in the annual Michigan Fine Arts Competition at the Birmingham Bloomfield Art Center. March really did come in like a lion. For starters, daily doses of economic bad news are dumping more black paint on our national angst and depression. On a personal level, my widowed mother has been wrestling with worrisome health issues all week. So I’ve been spending a lot more time in medical waiting rooms than I’d like. Following the advice I usually give my writing students, I try to relieve stress and worries by working on creative projects. I type, paint, scribble, collage, or print my way out of whatever’s gnawing at my peace of mind. To cheer myself this week, I completed a new altered art project. 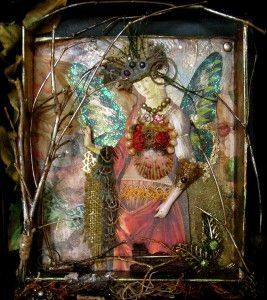 To view an album of my altered art pieces on Facebook, click here.